We must recognise dissent as a bedrock of a healthy society, without which there can be no creativity, innovation, disruption, progress and - crucially - democracy. On 29 November, the #COP21 international climate talks kicked off in Paris. Shaken by recent atrocities, the French government decided to ban demonstrations for the duration of the conference - a decision which spectacularly backfired as thousands of people left their shoes on the main square, gaining huge traction on social media and making France’s unprecedented crackdown on civil liberties an international news story. 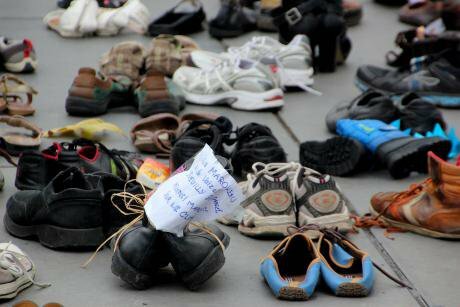 As one widely-quoted demonstrator remarked: ‘The shoes are marching for us’. A recent incident in Turkey offers an instructive parallel. On 10 October, Ankara’s main train station was bombed by terrorists allegedly linked to Da’esh, killing 95 and wounding 300 - the deadliest terrorist attack recorded in the country’s history. The government's response was to fire tear gas at bystanders, ban all press coverage of the attack, and - crucially - impose a slowdown on Twitter and Facebook. On one level, both examples illustrate a deteriorating rights climate in France and Turkey. But they also underline the paramount importance of social media as a conduit for dissent and its expression in the right to peaceful assembly. The French case demonstrates that social media is recognised as a crucial tool for exercising rights which are denied or repressed in physical forums. Turkey shows us that governments are aware of this, and have made internet shutdowns and other infrastructure or content manipulation part of their standard toolkit for repressing dissent and citizen mobilisation. These are not isolated examples. The 2011 Arab Spring was, of course, the first prominent example of a mass movement organised via social media; but the same dynamic was also at play in the 2014 Umbrella Revolution, where students in Hong Kong bypassed governmental internet blocks using social media and circumvention tools. Recent presidential elections in Burundi coincided with blocked websites and slowed connections, while the horrific ongoing civil war in Syria has seen the deployment of physical airstrikes in direct correlation with network disruptions, leading researcher Anita Gohdes to coin the idea of the internet as a weapon. These are just a few prominent examples, but they amply demonstrate that information and communications technologies (ICTs) are an emerging terrain of contestation between civil and state actors - creating new opportunities for both the exercise and restriction of rights. It is clear human rights should be as valid online as they are offline. But the human rights offering which exists today is the bare minimum of what states could agree upon internationally. With the advent of the digital age, shouldn’t we be asking for more? One reason for the unsatisfying realisation of human rights online is the inherent complexity of the internet. As a technology it can be intimidating to laypeople, with an unwieldy technical infrastructure governed by arcane languages, codes and norms. Although barriers to entry are theoretically low compared to previous communications technologies, few people outside of specific technical communities ever deal with ICTs for anything other than consumption, communication or simple word-processing. A broader approach, exploring the ethical or political dimensions of internet issues, is therefore typically left to those who write and build the tools - a state of affairs wholly counterintuitive to scrutiny and democratic oversight. One result has been the emergence of a broad binary of traditional human rights defenders (typically older) and digital rights defenders (younger), with little focused communication between the two sides. This absence of dialogue inhibits meaningful oversight of governmental action and allows for the formation of crucial legislative and technical grey areas, which governments do not hesitate to exploit, often to the detriment of human rights. The recent barely publicised passage of a highly invasive data retention bill in Russia, and the relative lack of outcry against the UK’s extraordinary Investigatory Powers Bill, currently being fast-tracked through its parliament with little scrutiny, are examples of this. How do we solve this problem? It requires, first off, a much more focused theorisation of how rights function in the digital age than has previously been attempted. Can all rights be directly translated online? What do freedom of religious belief, non-discrimination, the right to due process, freedom of movement, and social and economic rights actually mean online? France, Turkey, the Arab Spring and other examples are indicative of how ICTs can enable ‘assembly’ in the physical world, but should ‘assembly’ in its virtual sense - for example, a political discussion on Google Hangouts, or a decentralised online campaign like 'The Day We Fight Back' - also be protected as a human right? Would it then be considered a distinct form of assembly? Would it be a separate digital right? Or should we be moving beyond this presumed binary of online and offline altogether? Perhaps we need a new conception of rights. A conception which, instead of simply only guarding the limited offering we have now, makes a positive case for dissent as a wider civic responsibility. Dissent, defined here as the holding or expression of opinions at variance with those commonly or officially held, could serve as an organising principle for all different rights struggles. The full exercise of dissent, after all, would reasonably require strengthened versions of all the protected human rights we already have (e.g. right to assembly and association) as well as the recognition of currently unprotected or inadequately protected rights (e.g. anonymity, encryption, access). Under this umbrella, we could then push for the positive recognition of dissent as a bedrock of a healthy society without which there can be no creativity, innovation, disruption, progress and - crucially - democracy. Since 9/11, governments have, with considerable success, attempted to reframe dissent as criminal deviance, and human rights as a pesky encumbrance which risks national security. The only way to effectively fight this is through a paradigm shift: we need to strongly and loudly make a positive case for dissent, for criticism, for engagement, and define what freedom and citizenship really mean in the 21st century. Human rights are not, surely, the end goal of our efforts. They are the tools that help us achieve our fullest potential, which is something joyous, chaotic and unpredictable, not dry and legislative. But this isn’t what is happening. We fight the erosion of our rights on different fronts, with little coordination of our efforts. The result is division and confusion. Perhaps that is why the recent securitisation of cybersecurity discourse and legislation has caught many in the rights community off guard. It isn’t an attack on one single right, but rather the reframing of the definition of security towards systems and away from humans, with consequences across a wide range of different rights. Because we have no competing positive narrative to fight it with, all we can do is pick at the edges, raising concerns about privacy here, about data protection there. So how do we organise; and how do we then contest such efforts? We could start by encouraging better communications between rights struggles, to avoid the silos that have become characteristic. We could shift our messaging away from the risks of individual rights disappearing - often intangible and hard to visualise - to emphasise the crucial importance of dissent as a principle. And we could build and design tools that protect our anonymity and keep our ideas and communications private which are, at the same time, easy to use, visually appealing, fun and engaging. With governments rolling back rights all over the world, both online and offline, one thing is at least certain: we need to get into a position to start pushing back.